Digital electronics is a little more abstract than analog electronics, and trying to find a useful starter book can be tough. For those interested in learning digital electronics, with a practical approach, Beginning Digital Electronics Through Projects is for you. It is published in the same tradition as Beginning Analog Electronics Through Projects, Andrew Singmin's revision to the popular Beginning Electronics Through Projects. 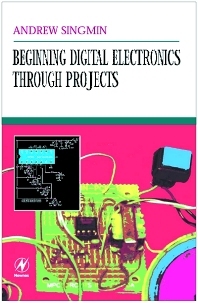 Beginning Digital Electronics Through Projects provides practical exercises, building techniques, and ideas for over thirty-five useful digital projects. Some digital logic knowledge is necessary, but the theory is limited to "need-to-know" information that will allow you to get started right away without complex math. Many components in this text are common to either analog or digital electronics, and beginners or hobbyists making their start here will find and overview of commonly used components and their functions described in everyday terms. Each of the projects builds on the theory and component knowledge developed in earlier chapters, establishing progressively more ambitious goals. Step-by-step learning instructions help you determine the best ways of working with such projects as Schmitt Trigger Circuits, Versatile ICs, Digital Support Circuits, and much more. Two interesting wireless projects (an FM receiver and an FM transmitter) bring the final chapters of this book to a close.